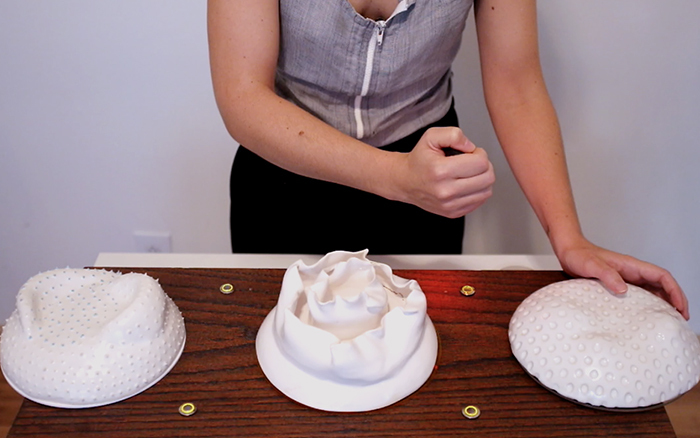 The gestural interface for Lobatus is constructed from ceramic pieces and wood. 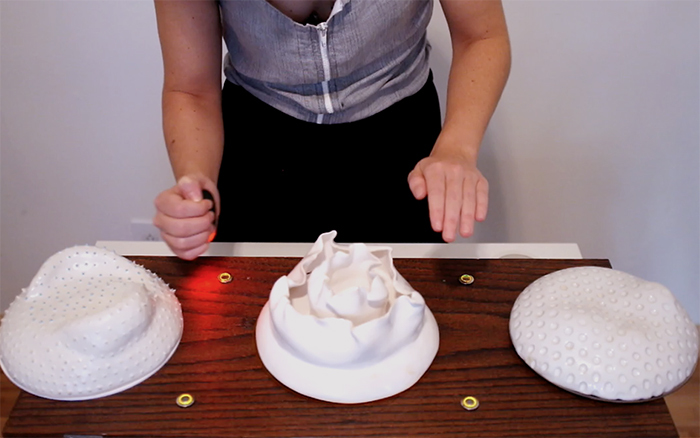 This project combines haptic feedback gestures with non-haptic ones. 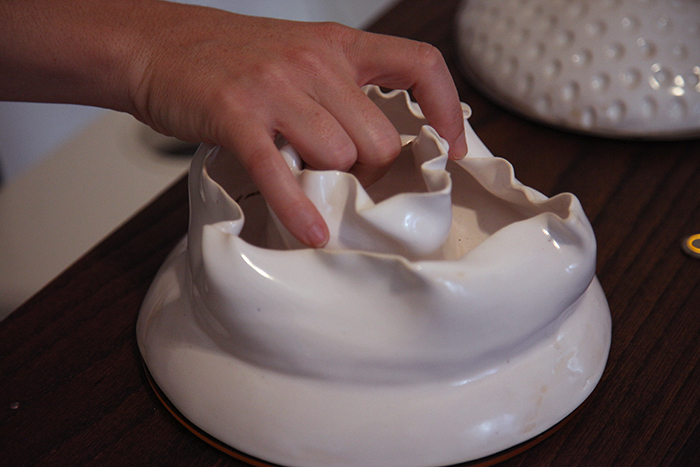 The motivation behind the three ceramic controllers in Lobatus was to reimagine the small knobs used in traditional commercial controllers and the gestural limitations they impose on the performer. Two photoresistors embedded in the wood also act as optical theremins, translating motion or light into varying patterns of sound. The choice of ceramic as the basis for the controls in Lobatus refers to the delicateness of the gesture that the instrument requires. The sound design built into the instrument plays with beat frequency effect, where very subtle shifts in frequency – associated with subtle gestures – have a noticeable acoustic impact. 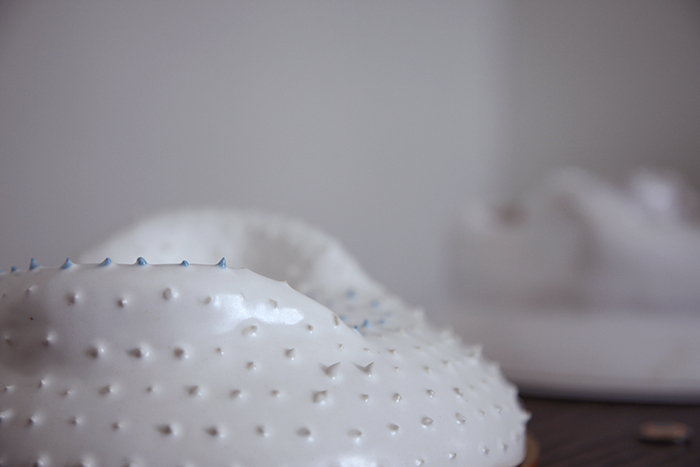 As with the textured surfaces of Espongina’s wooden bowls, the patterns in the surface of Lobatus’ ceramic controllers suggest a musical score imprinted in the instrument itself. During performances I produce sound not only by manipulating the controllers, but by reading the instrument’s surface with piezos in order to make it audible. Lobatus belongs to Ramona, a series of interfaces that aim to enhance the expressiveness of electronic music performance through a series of specific gestures and new materials.